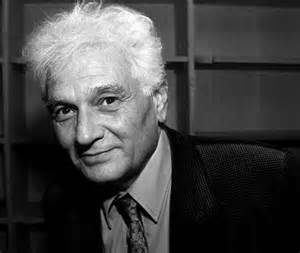 Jacques Derrida (1930 – 2004) was a French-Algerian philosopher and literary theorist who did more than anyone else to launch postmodernism. In 1966 he gave a lecture at Johns Hopkins entitled “Structure, Sign, and Play in the Discourses of the Human Sciences.” It was part of an event intended to commemorate the achievements of Claude Levi-Strauss, but Derrida’s reflexive application of Levi-Strauss’s ideas quickly undermined the influence of his older colleague. Levi-Strauss had written, in the conclusion of his anthropological study The Raw and the Cooked, “this book on myths is itself a kind of myth.” Was this not, Derrida wondered, giving the game away? Structuralism presented itself as objectively solid ground from which to conduct analysis – but if it was indeed a “kind of myth,” then this simply made nonsense out of the prior claim. Structuralism must itself be susceptible to structural analysis, since it was itself a system of thought, and the whole point of structuralism was to explain human thought. This realization had several important consequences. The first was that there could be no unexplained explainer, prime mover, or Archimedean point from which to leverage all knowledge. According to Derrida all Western philosophy had been characterized by the search for some solid ground of this sort – Plato’s Ideal Forms, the God of monotheism, the Reason of the Enlightenment, and so on. Expanding on Saussure, he called this concept a “transcendent signified.” Such a “logo-centric” philosophy always left something crucial out of its analysis – itself. But it could recover it’s self-awareness by subjecting itself to the same kind of analysis that it subjected others to. If this was true, it meant that a thought or communication could not be rooted in anything other than the language in which it was expressed – or, in other words, in itself. The price of self-awareness was self-limitation, for if one could only think in the concepts provided by language, and if that language itself was arbitrary, then the world could never be described just as it was. Rather, any description of the world was also a description of the speaker. There could be no “logo-centric” truth claims. This point has often been misunderstood (by advocates no less than critics.) It is in one sense utterly banal to say that “we never arrive at the final truth,” for most people will agree that there is always more to learn. We may not ever get to where we are going, but we are in any case going somewhere: we can know things. Derrida argued that what we do is interpret things, not know them, and that this interpretation does not arise out of the world as it is, but out of language. This has often been interpreted as the claim that nothing is true or false, and that one person’s ideas are as good as another’s. This is not quite correct. Derrida did indeed argue that there was no such thing as “truth,” but only “interpretation,” but it does not follow from this that all interpretations are equally valid. One cannot be “right” in any final sense, but one can still be wrong. The claim that an idea is either true or false, right or wrong, moral or immoral, is an instance of what Structuralists and Post-Structuralists call “binary thinking” – or, in other words, of the either/or fallacy. There are always alternatives. Similarly, the claim that philosophy is rooted in language is not the same thing as the claim that it is rooted in nothing, or that it is all make-believe. It is, rather, the claim that it cannot step outside of itself. Thus for Derrida “there is nothing outside the text,” or, as Heidegger would say, the world is “always already” interpreted. Further, since the signs of which a language is composed always have multiple meanings, every text (understood expansively as all arrangements of signs) admits of multiple interpretations. When we speak or write we usually have one or at the most a few meanings in mind, but we invariably communicate more than we intend, because words have a multiplicity of meanings. We want to make our meaning precise, but it’s like trying to nail jelly to the wall. This is normally seen as a bad thing because, according to Derrida, we have some “transcendent signified” in mind which we think can organize everything. We believe, in other words, that there is one and only one correct interpretation of a text. But if we give up on “logo-centrism,” we can see that multiplicity, or “free play,” of meaning is not only inescapable, but a good thing. Rather than busy ourselves with a continual and futile exercise in repression, we should recognize that “the text preserves its secret.” This leads us back to what Derrida called “the innocence of becoming,” in which possibilities that we ourselves have repressed, under the illusion of “logo-centrism,” reemerge as legitimate and indeed inescapable. These insights suggested a method of reading “logo-centric” texts which could show that they did not mean what they had been taken to mean, or did not, at any rate, mean only that. Where we might normally consider the incoherence of an interpretation to be evidence against the interpretation, the “free play” of meaning suggested that it was the notion of a single reading of a text which was itself incoherent. By “deconstructing” it, the latent contradictions within it could be demonstrated. There was always, Derrida argued, more to a text than it seemed to be saying, and since it was always in some sense incoherent. Or, put another way, it could never describe the world just as it was. Derrida can, I think it is fair to say, be described as both a linguistic determinist and a radical skeptic. His arguments, if accepted, were corrosive of every certainty (apart from linguistic determinism, which amounted to a kind of “transcendent signified” in his own system.) In the radical political and cultural environment of the 1960’s, people were ready to listen to far-reaching critiques of the existing order. In this respect, Derrida did not disappoint. Our next philosopher, Michel Foucault, applied Derrida’s ideas in a much more focused manner to politics – or, as he defined it, the relationship between knowledge and power.